Collaborating researchers in Australia and the US have discovered a nanoscale material that could boost solar-energy harvesting because of its potential to harvest heat when it’s dark to create electricity. Physicists from the Australian National University (ANU) and the University of California Berkeley (UC Berkeley) have shown that a new artificial “metamaterial” glows in a unique way when heated, sending off heat in specific directions. This characteristic has the potential to be used as a heat emitter with thermophotovoltaic cells, which convert radiated heat -- such as that from the sun -- into electricity, researchers said. 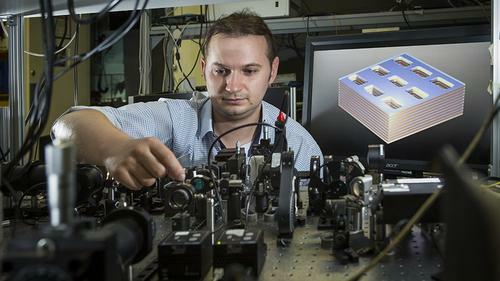 "Our metamaterial overcomes several obstacles and could help to unlock the potential of thermophotovoltaic cells,” said Sergey Kruk, a researcher in the ANU Research School of Physics and Engineering, in an article on the ANU website. These types of cells have the potential to be more energy-efficient than solar cells, he said. Indeed, research has shown that thermophotovoltaic cells can be twice as efficient as conventional solar cells because they don’t need direct sunlight to generate electricity. Instead, they harvest heat from infrared radiation present in their surroundings. They also can be combined with a burner to produce energy on demand, or can recycle heat that’s emitted from hot engines, researchers said. Physicists from the Australian National University (ANU) and the University of California Berkeley have shown that a new artificial “metamaterial” glows in a unique way when heated, sending off heat in specific directions. This characteristic has the potential to be used as a heat emitter with thermophotovoltaic cells, which convert radiated heat -- such as that from the sun -- into electricity. The metamaterial that Kruk and his team worked with is made of tiny nanoscopic structures of gold and magnesium fluoride. Its physical property -- known as magnetic hyperbolic dispersion -- is key to the material’s behavior and potential for use in thermophotovoltaic cells, researchers said. Dispersion describes the interactions of light with materials. The dispersion of the new metamaterial is different from standard materials like wood or glass in that it not only radiates heat in specific directions, but also can be manipulated to emit radiation in a specific spectral range, researchers said. This is in contrast to standard materials that give off heat in all directions as a broad range of infrared wavelengths. The team, which was inspired to look at the material on the behest of Kruk -- who predicted it would have these useful properties -- published an article on its work in the journal, Nature Communications. The ANU team tapped scientists at UC Berkeley for their research because the latter have specific experience to manufacture materials at such a nanoscale, Kruk said. "To fabricate this material the Berkeley team was operating at the cutting edge of technological possibilities," he said. "The size of an individual building block of the metamaterial is so small that we could fit more than 12,000 of them on the cross-section of a human hair." While the work done by the team already has shown how the material can improve the efficiency of a thermophotovoltaic cell, it’s possible to improve it further if the emitter and the receiver have just a nanoscopic gap between them, researchers said. In this way, radiative heat transfer between the two elements of the cell can be more than 10 times more efficient than between conventional materials, they said.